The P164B is a 16? battery powered smoke ejector. 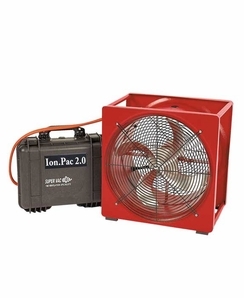 Powered by a Super vac IonPac2.0 battery (included), this fan can operate for 30 minutes to 2 hours on a full charge while maintaining the same output at other 16? electrical smoke ejectors. The battery can also be plugged into a 115V AC power source to run the fan and charge simultaneously.